Preheat oven to 400°F. 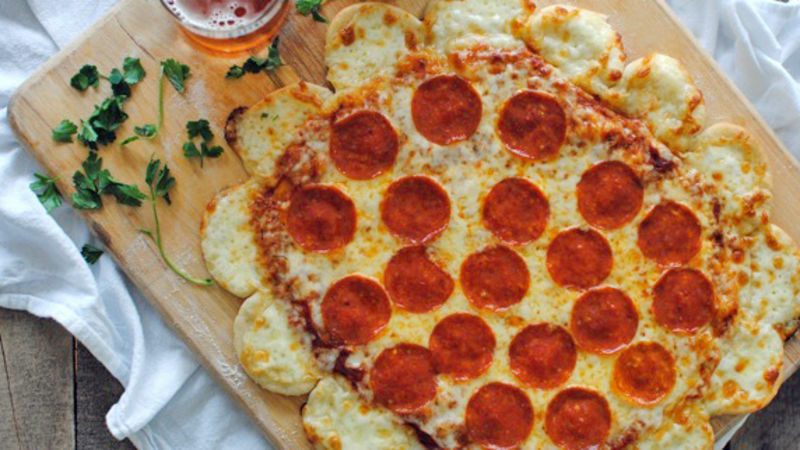 Roll out one of the Pillsbury™ pizza crusts. Using a paring knife, slice off the corners, making a circle. Save edges. Roll out the other pizza crust. 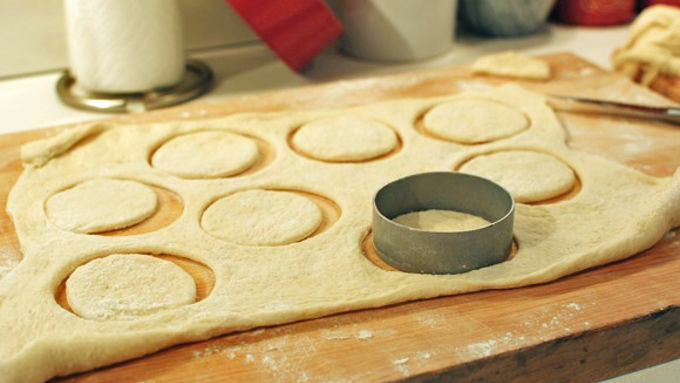 Using a cookie cutter, cut out 7 to 8 circles (depending on how big your cookie cutter is). You can use the saved edges for this as well. Slice each circle in half, creating semicircles. Press each semicircle into the edge of the pizza. Continue until all the the semicircles are pressed into the pizza. Using your fingers, pinch the edges of the half circles to create little bowls. Place the pizza on a large baking sheet (lightly coated with cooking spray) and par-bake the crust for 6 minutes. 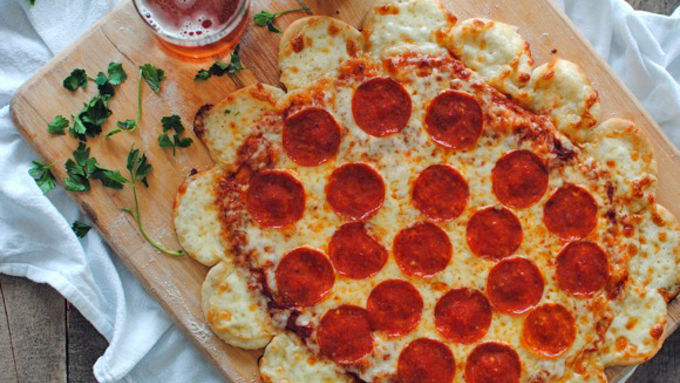 Remove from the oven and spread the pizza sauce over the pizza, not including the half circles. Sprinkle the cheese over the entire pizza, including the half circles. 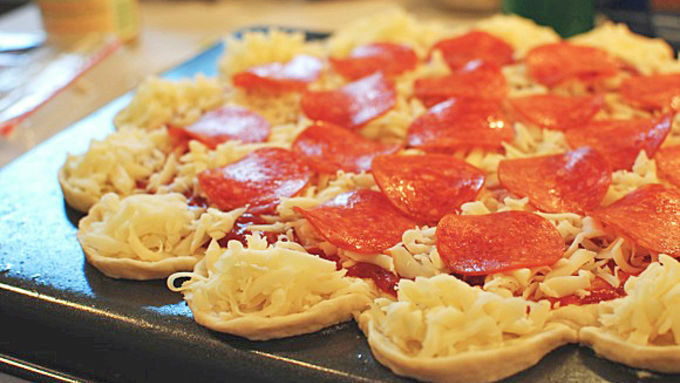 Layer with pepperoni and bake another 6 to 8 minutes, or until the cheese is starting to brown and bubble. Using a paper towel, blot the pepperoni to remove grease, if desired. Serve immediately! Help me. I know. I had a weak moment. I saw this Crazy Pizza on the TVs. And then my heart climbed into my throat and shouted up to my brain to please, please, please, replicate this as soon as possible, even if it looks seriously hilarious and kind of off. Once my brain was on board, there was really nothing left to do but obey. And I will say, in making this Crazy Cheese Crust Copy Cat Pizza, I made a few oopsies through the process, but I'll tell you what they were so you can do it right! Aren't I so nice? You don't have to answer that. Let's get CRAY-ZAY. (I have my hands in the air, like I just don't care.) Grab a couple of Pillsbury thin crusties. 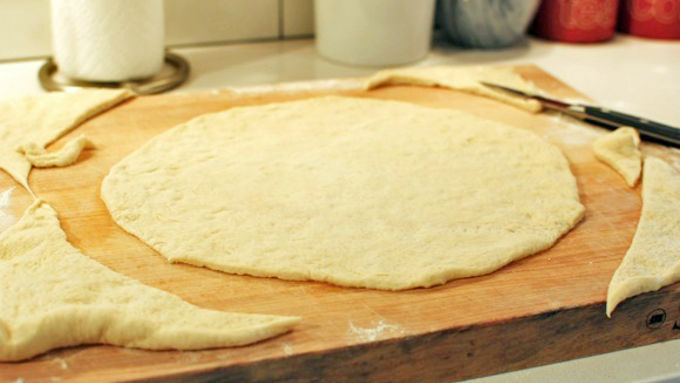 You can also use the Artisan crust, if you want it a little thicker. Also, grab a block of mozzarella, some pepperoni, and pizza sauce. Okay, I know it looks hilarious. And WAY different than what the TV commercial shows, but it made my soul crumble and my face giddy. Also, I blot the pepperoni to remove a little extra grease! Why is life so awesome?